Perfect for any warm weather special occasion like weddings, baptism, Easter or church! Comes with matching Light Blue Vest and Pants, white, grey and blue gingham buttoned down collared shirt and light blue bow tie. Its cool, modern cut makes little guys look awesome without looking "swallowed up." The tailoring is amazing too, which means lots of wearability. 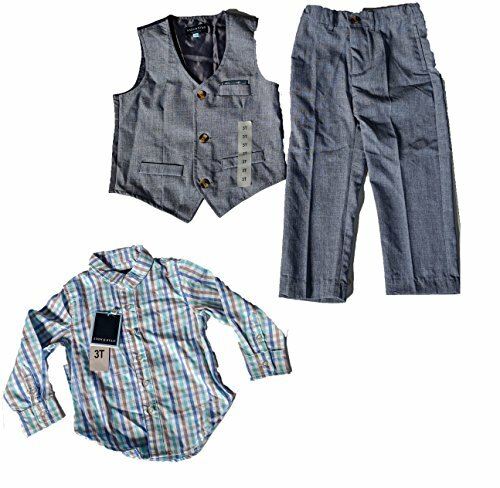 Tailored as well as men's suits, vest is fully lined and pants come with real pockets with adjustable inside buttons to accommodate growing. This modern but classic style will keep your little guy comfortable all day, without feeling constrictive. If you have any questions about this product by Andy & Evan, contact us by completing and submitting the form below. If you are looking for a specif part number, please include it with your message.